A nineteenth century, miniature cast iron stove complete with a selection of miniature copperware , a miniature cast iron iron and a pair of miniature, wooden salt boxes. The stove is French. It is marked, in the casting, ‘GODIN & CIE BTE S.G.D.G.’ . It is 32cm. high (excluding the flue) by 36cm. wide by 18.5cm. deep. Godin also made full sized stoves and this is a fully working replica of the larger models. It dates from c.1880. There is slight damage to two of the hinges on the doors and there would originally have been a small brass tap on the front of the water tank. This is now missing. Otherwise it is in very good condition. 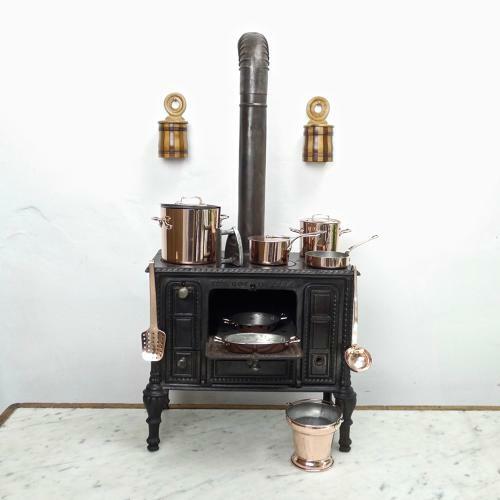 The copperware includes a large and a small stockpot, a saute pan, a saucepan and cover, two gratin dishes, a ladle, a fish slice and a coal bucket. These are all 19th century, they are good quality, and they are made in the same way as full sized items, with all pieces being tinned so that they could have been used. The iron is marked ‘DEPOSE’ and is cast with a cherub. The two wooden boxes are miniature, Scottish marquetry salt boxes and again they are exact replicas of the larger versions. They are 13.5cm high and they are most unusual in this size. All of the accompanying items are 19th century and they are all in excellent condition.